I cannot say precisely why Muldoon chose to run the simile ‘The snail moves like a/Hovercraft’ from the first line to the second, but I can say—and did say to my students—that it’s an example of enjambment, something to try if we want to achieve a similar run-on effect. As we begin drafting our own poems, I keep thinking about the pleasure of reading that simile, the surprise followed by recognition. 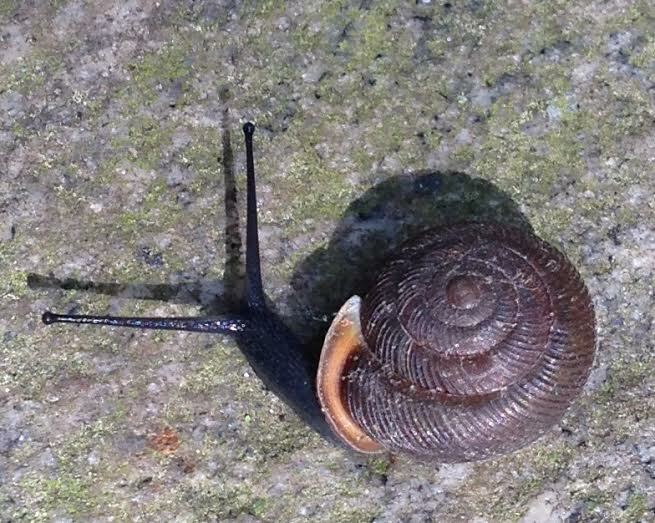 Never before had I thought of a snail moving like a propeller-driven hovercraft. And never before had I thought of the hedgehog and the snail as kindred animals for their ability to retreat into themselves. The snail, the hovercraft, the hedgehog, the crown of thorns: these are now linked in my mind. That’s what ‘Hedgehog’ has given me. I love this, Jane — I get more accomplished when I move slowly and steadily than when I race through things. How many times do I have to learn this lesson? Many, apparently. Thanks for this slow-moving reminder. You’re welcome, Rebecca, and thanks for reading. I have to learn the lesson over and over as well. There’s so much writing I need to return to, I’m still slowly trying to figure out what to do first.